Customers have embraced Tap to Pay in a big way! It’s been two months since we launched Tap to Pay and we are happy to share our customers have embraced this new payment option in a big way. To date, there have been 160,000 unique users who have tapped their contactless credit cards and mobile wallets—a combined—more than one million times! If you are a tourist in Metro Vancouver or an infrequent transit rider, Tap to Pay means no more ticket line-ups, digging for change, or worrying about fare zones. This is perfect for sports fans and concert goers heading down to BC Place or Rogers Arena to catch an event. Just tap your contactless credit card and be on your way! Taking transit to these games is also a great way to interact and banter with fellow fans about the match. Compass remains the best choice for regular users as it offers discounts. As always, remember—tap your card, not your wallet. Check out 5 things you need to know about Tap to Pay! TransLink was the first transit agency in Canada and one of the first in North America to launch this new payment option. With Tap to Pay, customers can travel across all modes in the same way as customers with Compass Cards. Customers can tap card readers with a contactless Visa or Mastercard credit card, or a device with an Apple Pay, Google Pay or Samsung Pay wallet. Learn more about Tap to Pay at translink.ca/taptopay. Links and tidbits is our semi-regular roundup of interesting fodder about transportation from the last few weeks or so. If you have links to contribute, put them in the comments or email us! » Looks like we are not the only transit enthusiasts here! This global network of Millennials called The Numtots – New Urbanist Memes for Transit-Oriented Teens wants to make cities better. Holiday service reminder and happy holidays from The Buzzer blog! It’s that time of year again – where all of us here at The Buzzer blog send our best Christmas wishes to you, our amazing Buzzer blog readers. 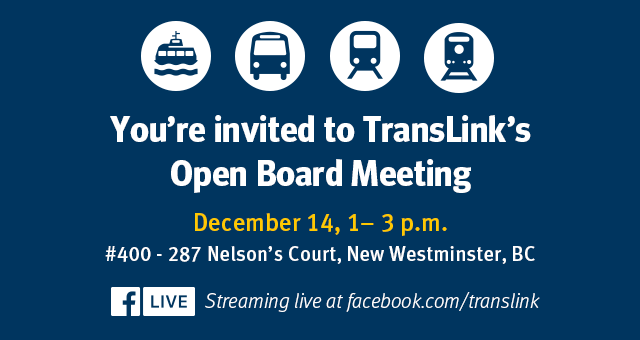 TransLink’s board meetings are open to the general public, you’re invited to attend next week. If you have an interest in getting to know the ins and outs of how TransLink works, this is the meeting for you. You read that right! On Monday, May 15, 2017, a three-month test of an electric battery-powered bus will begin! The bus, provided by BYD Canada at no cost to TransLink, uses slow-charge technology to provide enough power to drive approximately 250 kilometres on a single charge! This trial is just one of the environmentally friendly bus technology tests TransLink plans to launch as part of our commitment to helping the region meet its greenhouse gas reduction goals. The bus will snuggle in for its nightly charge at the Vancouver Transit Centre where our electric trolley fleet is based. During the trial, we will be able to test the bus on our system, take a look at its performance according to the bus operators and maintenance crews as well as the satisfaction of the customers in order to determine our next steps with this technology. Almost half of TransLink’s fleet of 1,386 buses is comprised of cleaner-technology buses including 262 electric trolleys, 116 compressed natural gas (CNG) buses and 252 hybrid diesel buses. BYD battery-electric bus fast facts! Battery designed to power bus for one-million kilometers before it needs replacing. Highly efficient and powerful AC in-wheel hub motors provide instant torque to perform in all driving conditions. Battery can also serve as a mobile generator. Excited about this e-bus? We are too and we’re just getting started! TransLink is developing a Low-Carbon Fleet Strategy and we will be launching a second electric bus trial next year. We’ll be sure to share all the details right here on the Buzzer blog. WHERE CAN YOU CATCH THE BUS? The BYD bus will be on various routes in Vancouver. On Monday, May 15th it will running on the #33 route. Other routes it may service over the next three months are the #25, #41 and #84. We’re going to try to get more specifics on the routes and will post that info right here on the blog. Check out our Instagram story from today’s demonstration! Read the media release about this bus trial here. Today on Bus Route Buzz, we’ve got some great news for Richmond as we continue the first round of bus improvements that the 10-Year Vision will bring over the next three years! Richmond, are you ready for your close-up? Improved weekday service to operate every 15 minutes, up from every 20 minutes, from 6-7 a.m. Improve weekday service to operate every 15 minutes, up from 20 minutes, from 6-9 a.m. and 3-5 p.m.
We’re improving service during the AM and PM peaks to provide a more reliable service to our customers. These changes will better match customer demand and reduce crowding and pass ups. Improved and consistent morning service to every 8 minutes from 7-8:30 a.m., every 10 minutes between 8:30-9 a.m. and every 12 minutes from 9-9:30 a.m. Improved and consistent afternoon service to operate every 8 minutes from 4-6 p.m. and every 12 minutes from 6-6:30 p.m. Improved late night service to every 30 minutes from 10 p.m. to 12 a.m.
We’re increasing service to better meet the needs of our customers. Many customers will experience shorter wait times for buses and between transfer connections, as well as reduce crowding and pass ups. We’ve added additional service from 6-9 a.m.
We’ve added additional service from 2:30-7 p.m.
We’ve added additional service from 1:30-4 p.m. and 10 p.m.-12 a.m.
We’ve added additional service from 10 p.m.-12 a.m.
AM, midday, PM Service operates every 20 minutes. Early evening service operates every 30 minutes, reduced from 15-20 minutes. Last trip to UBC Loop is at 7:50 p.m. and the last trip from Bridgeport Station is at 7:01 p.m. Provides service every 20 minutes (up from 30 minutes) on the weekend between 10 a.m. and 6 p.m.
We’re increasing service to better match customer demand and reduce wait times for buses and transfer connections. Additional trips to the Tsawwassen Ferry terminal are back! Service increases to two buses every hour, up from one per hour, to coincide with the summer ferry schedule. Be sure to check the BC Ferries schedules! Seasonal service runs from April 24th until September 4th (Labour Day – inclusive). Regular service will start on September 5, 2017. Until next time, Bus Route Buzzers, ride on! 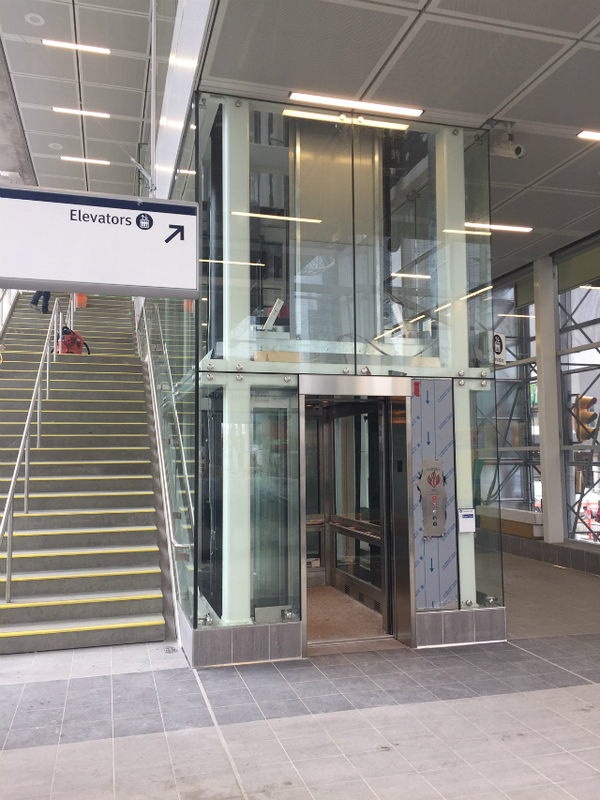 Metrotown Station elevator is open for business on March 24, 2017! Yes, you read that right. The first two of three brand new elevators will go into service at noon on March 24, 2017. And hey, these aren’t just any old elevators! These two new speedy elevators are glass (and shiny!) which means you can see them coming and going. They will replace the single elevator that was at the station. Once the remaining elevator completes testing, commissioning and inspecting, it will also open. All elevators are expected to be open by May. In addition to new elevators, the existing Compass readers will be replaced with permanent Compass fare gates. This is a huge milestone for the station! The new central stationhouse will fully open, providing customers with a new permanent set of stairs (goodbye temporary staircase! ), two more Compass Vending Machines, two elevators and a new entrance and exit out of the station. With these upgrades, customers on the platform can take the elevator, new stairs or the emergency exit stairs on the west side of the station to access Central Boulevard. The Community Shuttle for passengers travelling with strollers will run until March 24 end of service. The HandyDART shuttle will run until March 31, an additional week after the first two elevators open. Customers requiring the use of an elevator are advised to use the wider accessible pathway from the station by using the east crosswalk at the mall parkade entrance. Remember to tap in and out at the fare gates to ensure you are charged the correct fare. Please note that there is currently no escalator access at the station, only stairs and elevators. Four new escalators (two up and two down) will open at the west stationhouse in the summer. We understand everyone will be excited to ride the new elevators! However, please be courteous and remember that there are customers who require the use of elevators and they will be getting used to the new station entrance and layout. Not sure where to go? No problem! 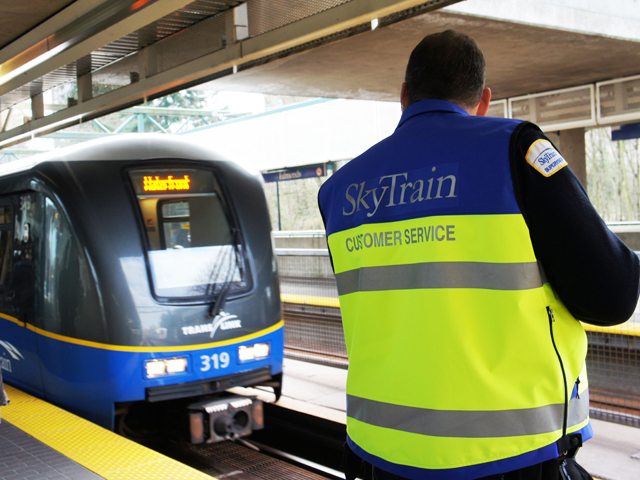 Our friendly Transit Security officers and SkyTrain attendants will all be on hand to help direct customers get where they need to go. 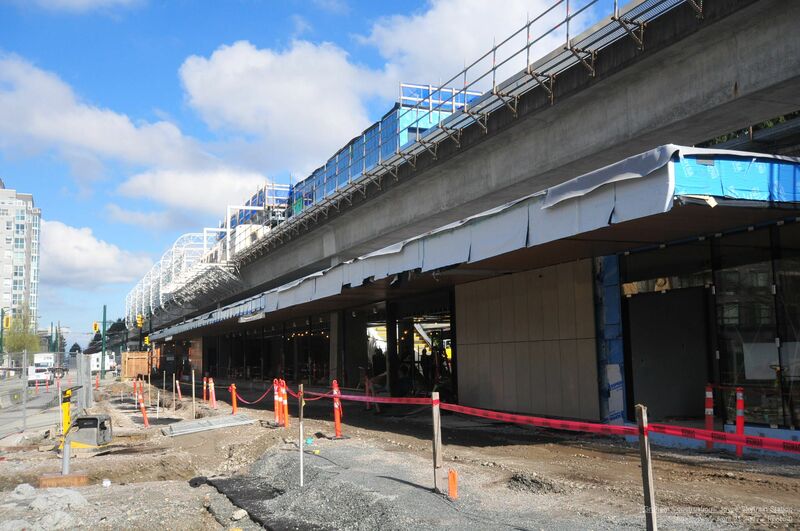 Visit our website for more information on the upgrades at Metrotown Station. Our latest poll was something of a hybrid. 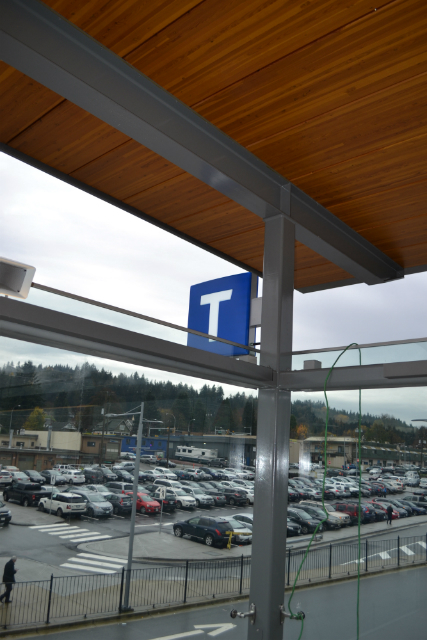 Dubbed as a Learn ‘n’ Poll, we posted many of the ways you can get information about your transit trips and TransLink. Then, you voted on which were your “go-to” spots for transit info. You did some learning, you did some voting and now we know that the majority of you head to the source, the mothership that is translink.ca! The TL website took the top spot with 88 votes. Next up were the ever-popular transit apps with 54 votes, followed closely by @TransLink on Twitter with 48 votes. Transit Alerts (either by SMS text or on the Alerts page) garnered 26 votes, “Other” – with a special nod to tcomm.bustrainferry.com – grabbed 13 votes, Facebook, radio and in-person info gathering tallied 12, six and five votes, respectively. Thanks for everyone who voted! Until the next Learn’n’Poll, keep on keepin’ on! Introducing our brand new Accountability Centre! Ridership in 2016 was at an all time high. TransLink’s service area covers more than 1,800 square kilometres. That means that over 90% of the region’s population either lives or works within walking distance of transit. Do you like numbers and facts like that? Well then, I’d like to introduce you to the TransLink Accountability Centre. This is your one-stop-shop for the TransLink “big” picture as we focus on a system that is customer-focused as well as being financially and environmentally sustainable. Regional Snapshot – what we do and where we go, including cycling infrastructure and the Major Road Network. Performance Dashboard – performance indicators in six categories; Ridership, Customer Satisfaction, Safety and Security, Service Quality, Efficiency, Environment. Transparency – links to our corporate reports, meetings and Freedom of Information requests. Our mandate is to get you where you need to go in a safe and efficient manner on buses and by rail and sea. We also know the importance of monitoring our services and examine how we can strive to be better delivering our service and more transparent to our riders. This is version 1.0 of the centre and we’ll be improving as we go. So, how can we make it better? What numbers and other items would you like to see? Leave a comment and let us know because we want to make it as good as we can for you, our customers! Where do you get your transit information? Welcome to the Buzzer blog’s Learn ‘n’ poll! From construction reroutes and weather to bus stop locations and Compass information, TransLink provides a virtual buffet of transit knowledge in a variety of places. We strive to get you any and all the details you need to keep you on time, on route and on transit. Let’s take a look at some of the avenues you can explore for all your transit needs. TransLink.ca is our one-stop-shop for all transit information. 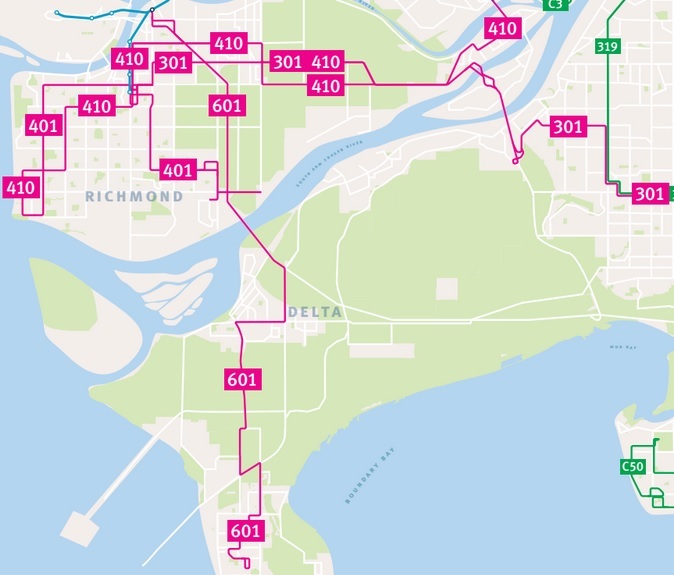 You can map your route using Trip Planner, see when your buses are arriving with Next Bus and learn all about TransLink and its operating companies in Schedules and Maps, Fares, Rider Guide, Getting Around, Plans and Projects and About Us. The homepage also lists other transit resources for you like YouTube and the Buzzer blog! Maybe you’re less interested in the Corporate Reports and more interested in what’s happening right now on transit. Not a problem! You can visit the Alerts page for an overview of the conditions of all modes of transit, station accessibility as well as any detours, construction or delays that may impact your trip. The best part about Transit Alerts is that you can sign up for alerts and receive SMS text or emails about your route and be the first to know about any changes in service. Another amazing resource is the Customer Information (CI) team on Twitter. You can easily tweet them @TransLink to receive answers to your questions about your bus, Compass information, operating hours, lost property and pretty much anything else you can think to ask! Not a tweeter? Give them a shout by phone at 604-953-3333. CI will be there to heed the transit call from 5:30 a.m. to 12:30 a.m. Monday to Friday and from 6:30 a.m. to 11:30 p.m. on weekends. 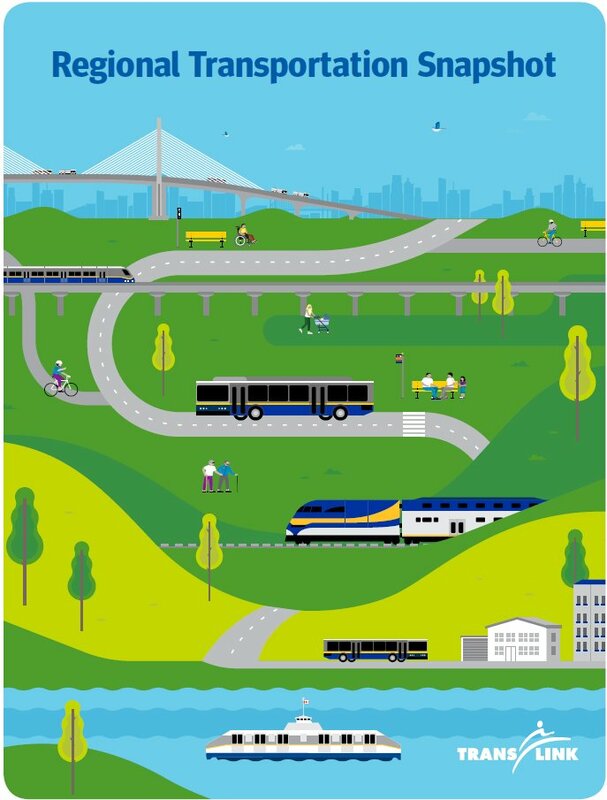 The TransLink Facebook page is a place for discussion, transit news, fun tidbits and lots more! The page is manned by the Buzzer blog crew (^rw, ^ac and ^sk, respectively) from around 8:30 a.m. until 4:30 p.m. Monday to Friday and we are happy to answer your questions during those times. If a major service delay occurs, CI will post outside of those business hours to update customers of impacts. In 2012, TransLink released our transit data as open source. This means that new transit apps based on our open API crop up giving riders access to information like GPS bus tracking. Last year we did a poll about your transit app options. Do you use any of these? Have a new one? Comment below and let us know! Remember! It’s always good to check in with Customer Information for clarification on any service issues. 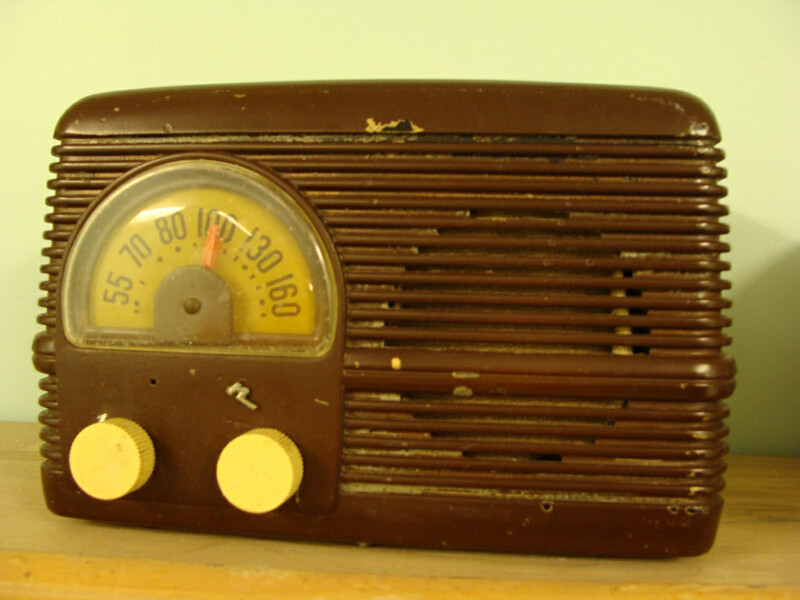 Remember the radio? It’s that thing that plays songs you can’t skip! In all seriousness, local radio stations are great resource for transit information. If there is inclement weather, a disruption or a major accident, local media are informed by TransLink so they can reach out to their listeners who may be affected. 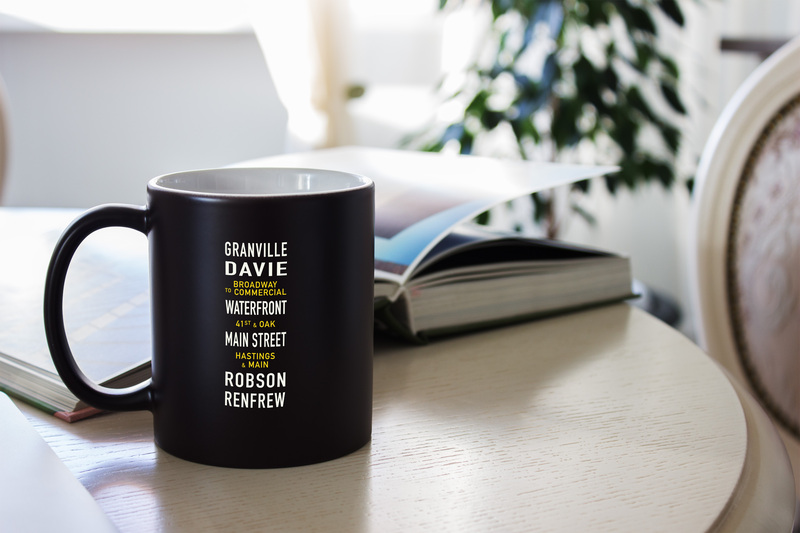 Tune in to News1130, CKNW and CBC 690 AM and 88.1 FM – just to name a few! For in-person assistance you can visit any of these reliable and accessible places for your specific questions. TransLink’s Compass Customer Service Centre for your Compass needs and Lost Property Office are both located at Stadium–Chinatown Station. The West Coast Express Office is at Waterfront Station and our awesome SkyTrain Attendants and bus operators are across the SkyTrain and bus networks. Transit Police has hubs at major stations and Transit Security is out and about helping customers across the region. Take a trip to your local library or rec centre and you’re likely to find transit schedules, system maps and Compass information as well! The time, as they say, is now. Let’s head to the poll! Weigh in and tell your friends! Another trip around the sun. 2016 – what a year! It’s been a busy and productive 366 (leap year) days for TransLink. Let’s take a look back at 2016 in the world of Metro Vancouver transit! In the spring, we welcomed new CEO, Kevin Desmond. Kevin came to TransLink from King County Metro Transit that serves the Seattle area. Kevin jumped in with both feet to lead the charge of a very full and important year while emphasizing our customers’ needs, transparency and excellent service. We’re so happy to have him at the helm! This word was on everyone’s lips this year! After a roll out that started with Upass users then West Coast Express, the general public adopted Compass with Monthly Passes at the beginning of this year. Then, on April 4, 2016, the fare gates closed requiring riders to tap in on buses and in and out at all gates to pay their fare. With Compass, you can travel seamlessly across the TransLink transit network with one card! Compass also allows us to gather important data on peak periods, bus route ridership and more – helping us better plan and run the transit network. May 2nd marked the 30th anniversary of Expo ’86 – the 1986 World Exposition on Transportation and Communication held on the north shore of False Creek. This was North America’s largest World’s Fair and a monumental event for Vancouver that left a lasting legacy – our SkyTrain system starting with none other than the Expo Line! SkyTrain started regular service on January 3, 1986. 100 years of the Buzzer. Happy birthday, Buzzer! The print Buzzer hit a major milestone anniversary of 100 years! This free, on-transit publication began on June 2, 1916 without a name. That soon changed and it has been delivering informative, fun and interesting transit and community related tidbits to the riders of the transit system ever since. You can pick yours up on your ride or download here. PM Justin Trudeau made some lifelong transit friends when he announced more than $900 million will be invested – by the Government of Canada, British Columbia and municipalities – in public transit projects across the province. This important funding promise allowed the Metro Vancouver Mayors’ Council to present Phase One of the 10-Year Vision for approval. But we’ll get to that soon enough! Rogers and Fido customers were treated to not one but two connectivity projects allowing riders to use their mobile devices. In July, the Dunsmuir tunnel downtown Vancouver was connected and in November, the Edmonds tunnel followed suit! Up next? We will continue to work with Rogers to build out wireless coverage along the Evergreen Extension, Columbia Station and tunnel and in New Westminster. This summer we hit one million active Compass Cards. That means that a million riders across Metro Vancouver embraced the switch to Compass and were tap, tap, tapping their way to and from school, home, work and more! With such great news, we had to celebrate with a fun contest to thank you for using Compass! These beautiful new SkyTrain cars were the hit of the summer! Especially because the A/C is just oh, so cool! These cars rode across country – on flatbeds – to reach out region. Each 4-car set is fully articulated (you can walk from one end of the train to the other), has more room for standing passengers, wheelchairs, bikes, strollers and riders with luggage plus, they are more environmentally efficient! Transit riders and enthusiasts eagerly awaited the first trip on August 18th and our Mark III VIPs got a front seat for the journey! Something old, something new, something borrowed something… transit? Hey, whatever floats your SeaBus! Jeff and Nathaly met on Canada Line and it was their dream to get married on transit. Enter a white (naturally) Mark II SkyTrain, a full band, wedding guests and one interloping Buzzer blog writer and you’ve got a SkyTrain wedding! It was a distinct pleasure to document this lovely couple’s big day aboard our beloved SkyTrain at Stadium–Chinatown Station. Poems, colouring contests, a special Buzzer, HTC opening tour, kids camp and more – we felt the transit love from riders of all ages at a variety of events. Interested in participating in next year’s festivities? Keep your eyes peeled for rumblings on the Buzzer blog in spring! In one September weekend we said goodbye to North Vancouver Transit Centre and hello to the brand new HTC building in Richmond! Did you notice? If not, that’s a good thing! CMBC made the seamless transition from one TC to the other and got your buses on the road from their no locale A.S.A.P. Hamilton Transit Centre has capacity for 300 forty-foot buses, including up to 80 community shuttle buses and 150 Compressed Natural Gas (CNG) fuelled buses. HTC performs three functions: dispatch, fuel and wash service as well as maintenance for buses servicing the Richmond, New Westminster, Burnaby and Vancouver areas. Opened in 1937, this bridge is one of the busiest Fraser crossings in the region. So, it’s unsurprising that while we go ahead with plans to build a new bridge, this ol’ girl needs some safety upgrades in the interim. We know the evening and weekend closures impacted a lot of drivers and we appreciate your patience as we rehabilitated the crossing to ensure its safety for all. Crews managed to finish early allowing for goods and people to move freely over the Pattullo Bridge once again . CUTA is the Canadian Urban Transit Association and this year’s Fall Conference and Transit Show happened right here in Metro Vancouver on November 5-9. This year’s theme was Inspiring Sustainable Change with a variety of seminars and speakers discussing today’s demands, tomorrow’s challenges and the possibilities for transit in our country and around the world. TransLink had many speakers engaging with experts and transit enthusiasts from around the globe. Including CMBC’s Derek Stewart who spoke about the impact of climate change to transit agencies. We are upgrading SkyTrain Stations across the rapid transit network. New Westminster was one of them. I say was because the work is done! On November 21, we officially completed and opened the overhauled station for riders to use and enjoy! Our region is growing and along with that comes greater need for public transit. The Mayors’ Council 10-year Vision Phase One was approved by the TransLink board and council on November 23. Along with the federal and provincial funding promised in June, municipalities will pitch in their share with TransLink for some much needed transit upgrades and projects. Metro Vancouver residents will start to see added service in the new year with much more to come in the coming months and years! Sometimes, it IS easy being green! On December 2, the Millennium Line Evergreen Extension opened to great excitement despite the rainy weather! The community celebration at Coquitlam Central Station ran all day with riders eagerly awaiting the first official ride on Evergreen. With this extension, TransLink has the longest, automated, driverless rapid transit system in the world! If you’ve ever called 604-953-3333 or tweeted @TransLink, you’ve interacted with CI (Customer Information). This crew works tirelessly to help keep riders informed on specific routes, transit timings, disruptions, detours and all things transit related! 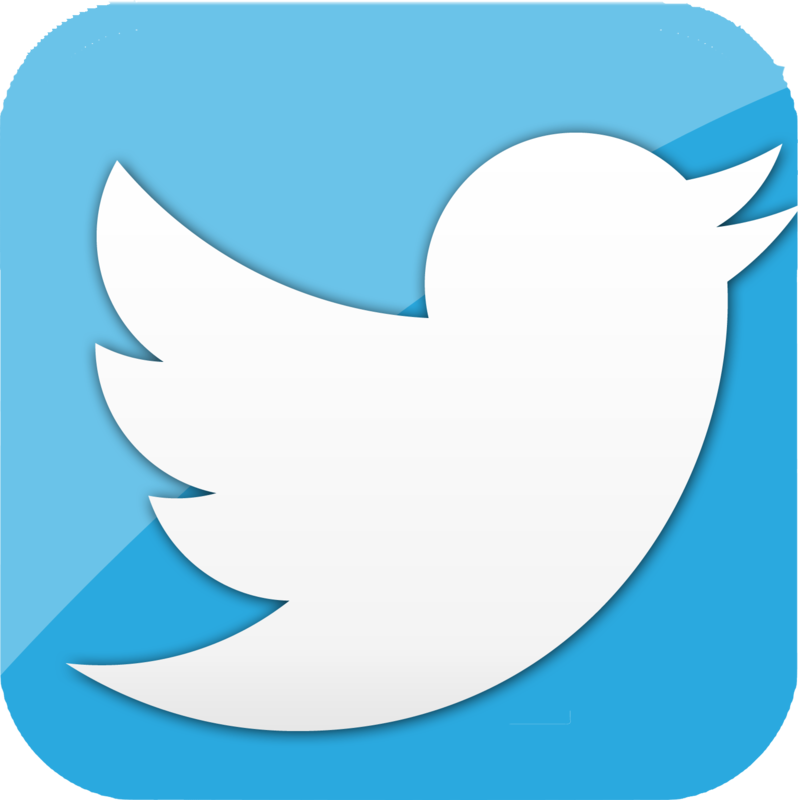 Started in 2010 as a pilot project, to date our followers have reached over 135,000 people and CI has sent out 295,039 tweets! A big thank you to these awesome people who keep us moving! Well, that about wraps it up. We can’t wait for what 2017 will hold for our region and transit! An important service reminder plus the Buzzer blog wishes you happy holidays! 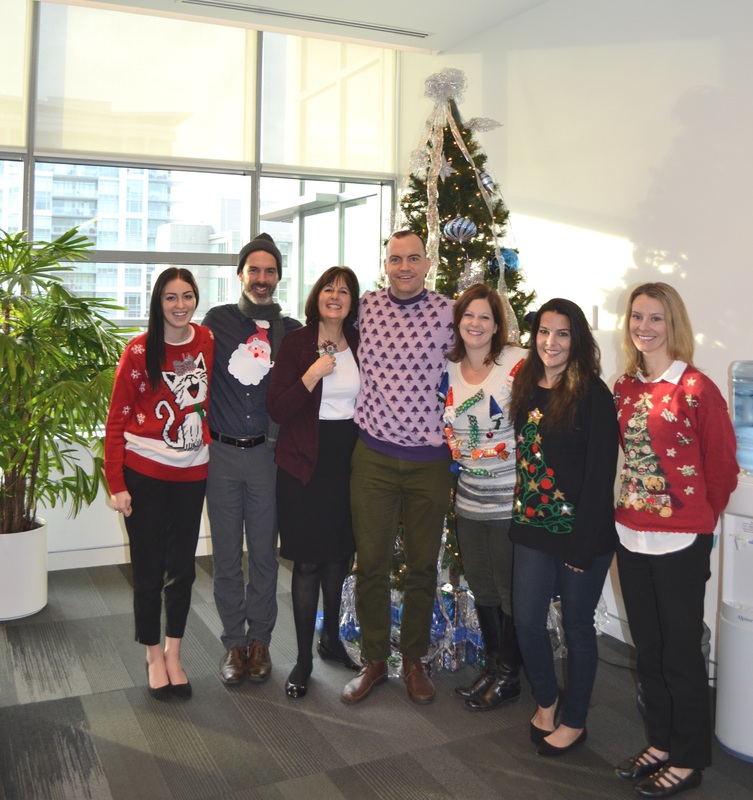 Yet again I have roped my colleagues into a group photo – this time, to spread some Christmas cheer to you, all of our amazing Buzzer blog readers. We strive to bring you informative, fun and interesting transit happenings from our agency and from across the globe. Thank you for being a part of our online community! Just as a reminder, with Christmas drawing nigh, transit will operating slightly differently over the next few days. Buses will run on a modified Sunday/holiday schedule; some routes will be adjusted from their normal schedule to reflect ridership levels. Use the Trip Planner (with the date of Dec. 25) to check your route and bus times, or read the Christmas Day Schedules below. SeaBus and SkyTrain will operate with a modified Sunday/holiday schedule. West Coast Express and TrainBus service will not operate. Buses will run on a modified Sunday/holiday schedule; some routes will be adjusted from their normal schedule to reflect ridership levels. Use the Trip Planner (with the date of Dec. 26) to check your route and bus times, or read the Boxing Day Schedules below. SeaBus will operate regular Sunday/holiday service with extended evening trips. SkyTrain will run Saturday service with extra trains running midday to accommodate shoppers. **Please check the website as timings are subject to change. Bonus! On Sunday/holiday schedules you only need a one-zone fare to travel across all zones on all modes! Remember, if you’re enjoying some libations during your merry merriment, please plan ahead for a safe ride home. 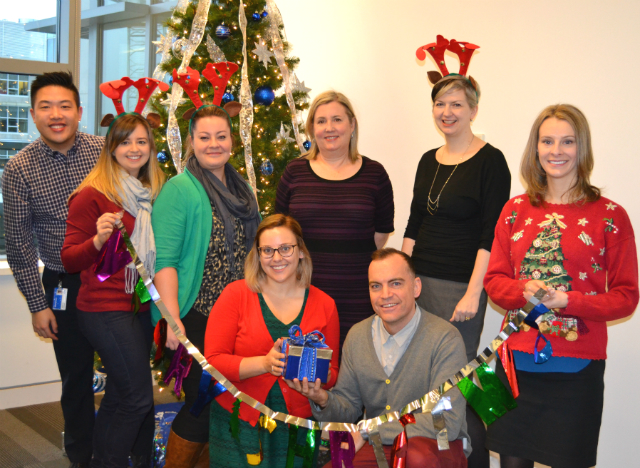 The social team will be off on December 24 and back December 28. If you have questions please tweet @TransLink or call 604.953.3333.